Green hills in California never last long enough to achieve that deep, lush color found in the Midwest or Seattle. The green remains bright, almost electric, for about three months, and then it begins to fade. And I begin to hang on, as if I could hold the season still by wishing it so. First the hue ebbs, as if nature has changed to using watercolors, and then patches of brown begin to appear. Then one day, as happened this week, it shifts. The hills turn golden. The oak trees with their dusky leaves stand out against the grass gone to seed and the landscape is beautiful again. Of course it probably never lost its beauty, but that transition time is so hard, not because of anything inherent to it but because I want what is gone and fear what is to come. Life is so often like this. Transition is so often difficult. Perhaps the indefinability of in-between times upsets our footing or the reality of something new coming into being demands dance steps we don’t know. Or maybe during these times we are forced to pay attention to the transition we are always in, from the cellular level on up. If we stopped wanting to return or skip ahead, would these times be easier? Neither regret nor fear exist in the present. They are a relationship we create with what has passed or what is to come. I’m not suggesting that if we achieved mass enlightenment, we’d no longer need to mourn. But if we could embrace our transitions, we might find beauty where before we saw only hardship. Here is a poem by Naomi Shihab Nye that wonders about this type of thing. I found it on the Poetry Foundation website, which is a wonderful place to visit. After a nine-year trial period, California’s Central Coast recently began to feel like home. 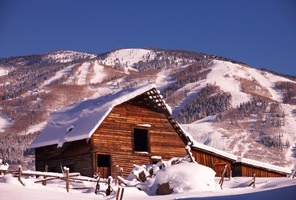 Then I went and confused myself by going back to my hometown of Steamboat Springs, Colorado, for Christmas. The week before leaving, I caught myself driving down the street enjoying this place I live, not judging it or categorizing it—a better or worse part of town, these attractive features, those not-so-desirable features. And oddly, after resisting it for so long, feeling at home didn’t scare me. Steamboat Springs in all its glory. Home is a potpourri. It includes a sense of belonging and acceptance—both of oneself and of the place—but also a familiarity, a sense that here, things are as they should be. It takes time for a spot of earth to transform into a home, and the process is somewhat mysterious. After graduating from college and before moving to the Central Coast, I never lived anywhere more than two years. I never intended to stay, but at some point the prospect of finding the grocery store and post office all over again in a new town overwhelmed me. During that itinerant period Steamboat held unqualified home status. It probably helped that I lived in the same house from preschool through my senior year and generally enjoyed childhood. A good part of our self-concept is wrapped up in the corner of the world we choose to call home. For several years, I had a dual identity. In California, I’d say, “I’m going home for Christmas,” and when I was leaving Steamboat, I’d say, “I’m going home Sunday.” Even this year, I refused to raise my hand in church when the lector asked who was visiting from out of town. I have yet to figure out what you lose and what you gain when your hometown is no longer your home. I do know Steamboat’s beauty makes my breath catch in a way it didn’t when I lived there. I also know I have lost the Coloradan’s conviction that you are not really living unless you have to contend with snow nine months of the year. Driving to the airport in Denver on one of the only truly cold days during my trip, I saw an underdressed woman hitchhiking on the side of the road. She looked as if she were leaving somewhere rather than going to somewhere. The look on her face reminded me that I am incredibly fortunate to be able to do both.